I've been playing this game for about an hour and a half (has it been that long? ), and I figured I'd give you guys my first impressions before I dive back in. I think it's safe to say that even though the current version is in pre-alpha, it's one of the most impressive pony gaming projects I've seen to date. Yes, you heard that right. More of me waffling, a couple of tips, and a bunch of screenshots after the break! Mane6, creators of Fighting is Magic, are doing quite a bit of stuff at Canterlot Gardens as many of you have probably heard. 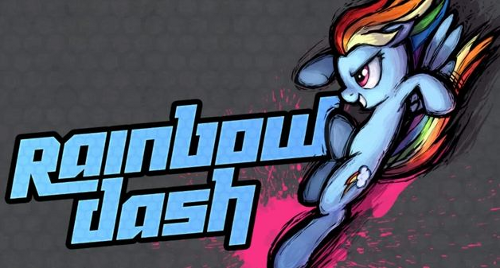 They have a panel, and will be livestreaming a new build of the game (with Rainbow Dash included) at the con. You can see the stream here, or on their website. Also, tomorrow they'll be hosting a massive Fighting is Magic tournament starting at 12pm, with prizes. The competition may get heated - too bad I'm not there, because I would definitely take first place (not really). We figured that you would all like to know that during Canterlot Gardens, Legends of Equestria will be undergoing a little stress test. What does that mean for our readers? Well, it means that from September 28-30 LoE will be open to the general public! That's right, for a limited time only everypony will be able to give Legends of Equestria a spin (except for Linux/FreeBSD users, who will have to wait for the release of Unity 4), and we'll be able to see how far the dev team has come. Once my extremely slow 20-90Kbps internet connection finishes downloading the game I'll test it myself and give you my thoughts on the game so far, but don't worry! Since the developers openly admitted that it's still in Pre-Alpha and not a finalized product I won't be unfair and give the game a score, but only a "first impressions" post. That sound good to you? Also, there's a torrent for the LoE pre-alpha over at http://www.legendsofequestria.com/LoEPreAlphastresstest.torrent, which we advise that you use if you can. Have fun! As far as I know, My Little Pump it Up is the only fan-made project dedicated to ponifying StepMania 5 - which, to be honest, sounds pretty cool. Maybe this could be the next convention gaming staple. The team is creating the interface more or less from scratch, but they need money to purchase a machine in order to show off the beta at BronyMexiCON. Head over to their site to check out the project or donate! My Little Game Jam Date Announcement + Theme Voting! Earlier this month we posted about about this upcoming event called My Little Game Jam, a 2 day game-creation competition. Back then we had no idea as to when this was taking place, but now with the release of the team's new, sexier website website we can now confirm that the event will be taking place on October 5th at 23:59 UTC. Theme voting is also up, so if you want to help decide what the games must be about then you can do so over at http://www.mylittlegamejam.com/themes/. You can also suggest new themes if you'd like, but try and not go overboard like you guys did with that silly Dub the Dew contest. After all, who would want to play (or make!) a My Little Pony fangame about Fred Durst Society of the Humanities and Arts, eh? And no, I am not wishing luck to the hopeful contestants, as I trust that they won't need luck. Our fandom has some very talented developers, you know! It's been a long time since we've heard anything from the Spike's Quest developer, but yesterday he decided to release a graphical showcase of a particular ingame room. It's fairly obvious that he has put a lot of work into this project, but it almost feels as if it is missing something. Part of it probably has to do with the cluttered environment and overwhelming amounts of detail that take the focus away from the main character. At times Spike almost feels invisible with all pillars and grates standing in front of him, but thankfully good ol' MisterBull appears to be aware of the issue and will hopefully resolve the issue before the next playable release. I am also of the opinion that adding a slight parallax scrolling effect to the pillars in the front and back would have a positive effect on the environment's three-dimensional feel, although again it's up for MisterBull to decide as to whether or not he will include that effect. Out of all the My Little Pony:Friendship is Magic fanfics out there My Little Dashie is probably the most beloved. The concept of a man finding a cardboard box and opening it to find his very own filly Rainbow Dash inside was rather cute, even if the story was a tad predictable and considered sappy by some (such as myself). It didn't really surprise me when the nice folks over at The Daily Oat decided to begin work on a visual novel adaption of the classic fanfic, and I must say that it seems to be turning out in a rather nicely. I'll let somepony else review this visual novel when it comes out, but in the meantime why don't you give the demo a spin, eh? 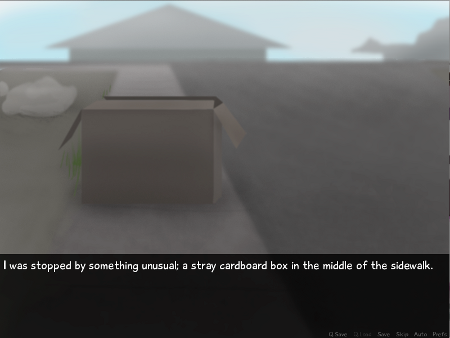 The demo seems to be only for the Windows/Mac platforms, even though the Ren'Py engine also supports Linux and Android. Hopefully they release a Linux binary for the final release, but in the meantime it looks like you'll have to use Wine for this baby. Sorry! 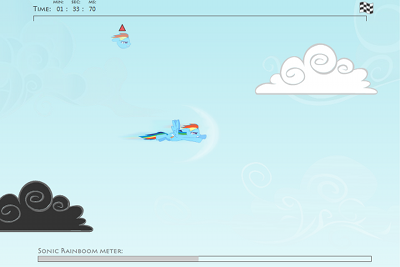 A cloud dodger... with flash animation? And it just updated? I love you guys sometimes. 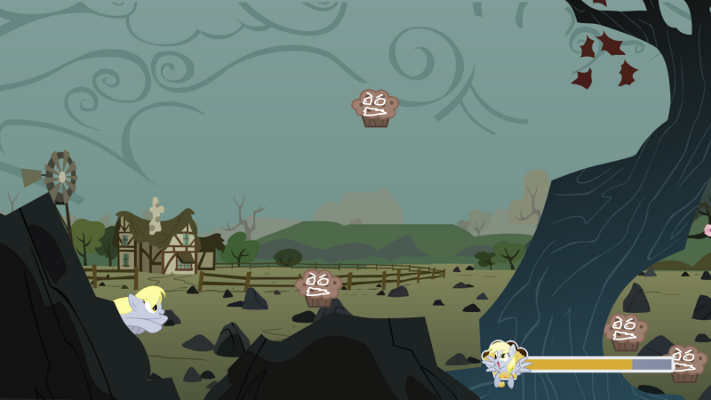 Somepony's caused chaos near Discord's statue, giving him just enough power to turn muffins into muffin-zombies. He's trapped the Elements of Harmony in their homes, planning to bide his time until chaos reigns and he can rule Equestria once more. Fortunately, he hasn't accounted for Ponyville's resident muffin expert! More after the break. As season 3 draws ever closer, the MLP: RiM team is gearing up for the release of their next edition, and they're looking for more of you brilliant pen-and-paper gamers to help them out. I suppose I'll just let Tall Tail tell you about it himself - have some copypasta, after the break! As I said in my previous post I have never been entirely sure as to why the Brony fandom seems to have fallen in love with Welcome to Ponyville. The one that seemed most likely to me based on my observations was that they really wanted a game in which you could date ponies (which isn't really that strange, given that there was a pigeon dating simulator of all things) and this game promised both that and a fairly decent visual novel experience. Now that Act 1 (which is essentially a demo of the final thing) has been released we can play this game for ourselves and decide whether it really has lived up to the hype. Just how good is Welcome to Ponyville? Find out in our review which we have conveniently placed after the pagebreak. 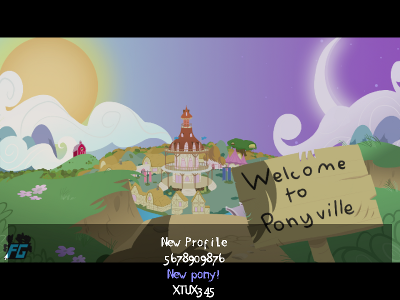 Welcome to Ponyville Act 1 Released! Back in March a visual novel-type game was announced named Welcome to Ponyville, and for some reason people got really excited about it. Most would expect that the sudden explosion in popularity had something to do with that desire many Bronies have to visit Equestria, but eventually it turned out that most of you sickos just wanted to get your hands on the romance portion of the game and ship yourselves with Lyra Heartstrings. To be honest I wish that they had downplayed the romance portion of the game, but either way Welcome to Ponyville should be a rather interesting game. As this post's title should have indicated to you the first act of Welcome to Ponyville was released earlier this morning. The 1.14 gigabyte download (which they foolishly refused to compress) is enormous for what essentially amounts to a demo for a visual novel, although from the looks of it most of the space is taken up by audio files. We'll give you a review of the game and guides to running the game in Wine once we have finished downloading and playing it, but hopefully Act 1 is worth the 1.14GBs of hard drive space that it has taken away from me. Also, for downloads we recommend that you use the torrent over at http://kat.ph/welcome-to-ponyville-act-1-t6676897.html for faster downloads. If you can then we would really appreciate it if you seed the torrent after downloading; after all nopony wants this torrent to be dead by the end of this day, right? For those unaware, Game Maker is a software engine designed to allow users to easily create games using a simplified interface. It even comes with it's own scripting language. The handy lite version is free to use, and thus it's a common platform for pony game development. However, it is not without its problems. As easy as it is to use, it's limited, and is often dismissed by more serious developers. The lite version, in particular, makes it very difficult for one to share their game in a web-friendly format, meaning that games made in Game Maker often get very little exposure. Thus, we've created the Game Maker compilation post, designed to showcase what's been made in this little engine. As this is a compilation-style post, this is not a showcase of the best of the best, but an exhibit of everything--however, some really neat, challenging little games slip by under the radar. Today we've got some Pinkie Pie platforming, pegasus blasting, and even a Tank game lined up after the break! Ever since their release the Desktop Ponies sprites have been used in almost everything. Yes, they are good-looking retraux pony sprites but at times one likes to see developers do their own sprite work for a change. I can say from experience that the main problem seems to be that four-legged characters are rather hard to animate properly and simply using a standard set of sprites saves much time and lets the developer work on things other then character animation. 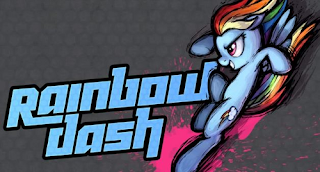 The creator of the dully-titled Rainbow Dash Shooter Project claims that his game's graphical resources were created entirely by himself, and this may be either a good or bad thing depending on his artistic talents. Of course, it is not the graphics that matter most as the gameplay, so how has this project turned out? Find out after the break. I'm not really the singing type, but I know that there are plenty of Bronies that would like nothing more to sing along to songs from My Little Pony: Friendship is Magic and get points for it. If you happen to be that type, then today is your lucky day! My Little Karaoke, a massive song pack for various karaoke games (such as UltraStar Deluxe, Performous, and Vocaluxe), has seen its first release and features various songs both from the show and from our glorious fandom. I haven't played it myself since it happened to share its release date with Black Mesa (which I spent all of last night downloading) but I hear that it's really great, so why don't you give it a shot, eh? The vast majority of our fandom's fangames are in 2D, and for good reason. Ponies in general look much better when drawn in two dimensions then in three unless some performance-taxing cell shaders are applied. Even then they don't look quite as good as some would hope, but alas, some game types are nigh impossible to create without 3D graphics. Is Questria one of these games? No. Many a hack 'n slash RPG has been made with hand-drawn sprites but this game refuses to use anything but 3D. Does it work? As you can see from the above trailer...not really. The ponies look rather unconvincing up close but thankfully the game's top-down perspective hides this most of the time. Questria still needs a lot of work, but if all goes well it shall hopefully develop into a wonderful little multiplayer RPG to play with your friends. We saved the actual gameplay video for the space after the break to scam more pageviews out of you. Aren't we mean? 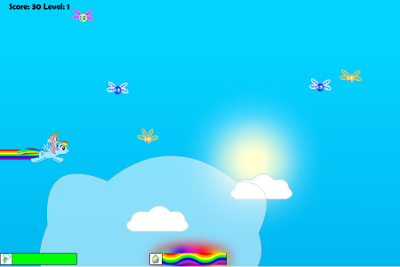 This little flash game has been passed around a lot lately, and rightly so! In case you've been out of the loop, I'll give you the upshot. In the latest game from futzi01, you play as an anthropomorphic purple unicorn attempting to snowboard down an endless rock-strewn mountain. Dodge rocks and changeling beams, and accidentally smash into floating logs. Awesome, right? See for yourself. This video is the third in the series chronicling the development of Fluttershy77's sandbox pony rpg. Although a ways from publication, the project shows promise - future development plans include a fully playable map of Equestria! Hit up the video above, and give the alpha a play to get a feel for the project. Then, if you're interested, give him a shout - he's on the lookout for spriters. More Footage of The Lost Kingdom + Boss Preview! Even though we just posted about The Lost Kingdom a few days ago we decided to give the game yet another post due to the release of two more gameplay videos. Why not just add them to the previous post in an update, you might ask. 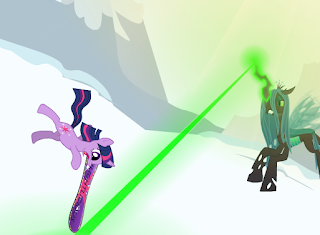 Well let's just say that the above video contains a bossfight preview and since everypony likes bossfights we decided on letting it share an entirely new post with another recent gameplay preview that, sadly enough, suffered from a distinct lack of gigantic arachnids which fated it to sit below the break, unseen by those too busy or lazy to bother reading what lies beyond that fantasmagorical link below. If any of you remember remember Pitfall! or know what it is, you deserve a medal. 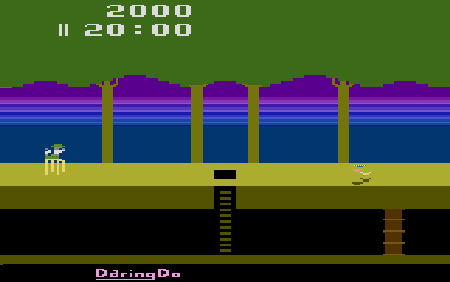 The very first platformer ever created, Pitfall was a major hit back when it was released, selling over 4 million copies and was the second best-selling game on the Atari 2600. One thing that the game has always lacked, however, was ponies. Sure the game had an awesome little man, snappy crocodiles and horrible scorpions but not a single equine was included in any of the game's releases until the release of this mod. Daring Do vs. the Everfree Forest is a brand-new ponified mod of Pitfall that replaces Pitfall Harry with Daring Do and the various monsters with pony-related ones. Unlike some more recent projects this game stays true to the original system's technical limitations which is a huge plus for those of us that remember playing the original. Daring Do vs. the Everfree Forest can be found at http://daring.do/, where you can either play the game online via a java emulator or download it to play on your emulator of choice. Have fun! Back in late July we posted about a very interesting RPG titled MLP FiM: The Lost Kingdom that was of an unusually high quality and managed to overcome some rather annoying colour limitations in RPG Maker 2003. The creator was quite grateful for us featuring his project as it was virtually unknown up until that point, and even wrote two rather nice thank you posts (found here and here). However up until yesterday there was a distinct lack of actual gameplay footage for the Lost Kingdom. Mind you the screenshots that were provided were pretty screenshots, but there's nothing quite like a couple videos to see how the game looks in motion. Upon realizing this Beanseh managed to record a couple video previews in between frustrating sessions of Canterlot Siege yesterday. His videos are pretty low-rez and have that ugly Fraps logo hovering over them but it's better then nothing at all, right? The remaining two videos can be found after the break. Good (late) evening, mares and gentlecolts! For all of you teaching and learning this fall - myself included - who are regretting the end of another fantastic summer, I have just the thing. As for the rest of you, you'll probably enjoy this too. Yes, the fabulous futzi01 has once again landed a game upon my reviewing table. And it's a tower defense title, no less - something which we can never have enough of. Can the mane 6 blast their way through parasprites, griffons, and diamond dogs to become a fandom classic, or do they fall a little short? All this, and a secret code, after the break! Not far too long ago a trailer was released for a retraux Daring Do platformer. What flew past everypony's radar was that a demo for the game came out within a couple days of the trailer's premiere, and I must say that it's pretty good. We'll get around to reviewing it when the full thing comes out, but let me say that it is fairly challenging and should take a decent amount of time to complete due the the length. The retraux feel of the game is also quite nice, although purists will cry foul upon the realization that the game uses more colours then were available on the NES. Also, the game runs pretty well on Mac/Linux in Wine, although for audio to work you will need to install dsound and directmusic via winetricks. Doing the same thing for other fangames created with Game Maker often reduces the amount of audio-related issues that you'll encounter, although your mileage may vary. One of the more unfortunate aspects of my being given control over the site was that I could not afford to hold game development contests like we used to. 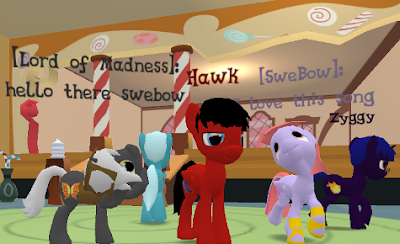 Some of our fandom's most well-known fangames were spawned during those contests such as Story of the Blanks during our Creepypasta Game Contest, and Super Filly Adventure during the Brony Day Terraria Giveaway (although it seems that silly ol' Strawberry Spice forgot to give the winner his prize). The newly-spawned My Little Game Jam is a similar contest and to enter one must create an entire game by yourself within 48 hours. Sounds easy, no? Not so fast, bucko. The game also has to be created entirely from scratch, so you have to draw all the sprites, make all the music and program all the stuff by yourself. Lovely, eh? Of course we can't wait to see what you guys will make during this contest, but before entering we would advise that you visit the contest's website at http://www.mylittlegamejam.com/ and check out all the details first, just so that you don't accidentally break any rules in your entry. Ponymon Dawn/Dusk is a fan project dedicated to producing ROM hacks of Pokemon Fire Red/Leaf Green. Battle, train, and evolve 151 ponies with custom move sets and their own type trump chart. More information can be found on their handy wiki, which also contains an faq for those unfamiliar with using emulators or concerned with updating their save files to the new version. The new version includes a ton of new ponies and new areas, and I really can't recommend it highly enough to Pokemon fans. Happy hunting! Are you an animator and wanting to help out with a fan game? Then Equestrian Dreamers, the development team behind My Little Investigations could really use your help as they are looking for a Field Character Artist. They expect you to be familiar with/a competent user of Adobe Flash, Illustrator, and Photoshop, so if you think you have what it takes then read the full requirements and apply for the job over at http://www.equestriandreamers.com/recruitment/visual-artists/. This is a new feature which we're considering adding to EqG's lineup - the Developer Spotlight. In it, we hope to showcase the work of different developers and devteams throughout the fandom. We'll start out this week with futzi, flash game maker and animator nonpareil. Our little pony gaming site has grown quite a bit over this past year and a half - including views from the Arcade, we've almost hit 4 million pageviews! We at Equestria Gaming aim to continually improve our site as we grow, providing more and more varied content for you all. With our new submit system and big improvements to the EqG Arcade in the works, we've started working on improvements here and there. Today marks the first day in a weeklong test of a new weekly posting schedule for Equestria Gaming - something to make sure you get a big share of pony gaming content each and every week. You can find this test schedule below the break. Keep in mind that this is what it is - a test, and is definitely open to change or improvement. Unlike many other fandoms My Little Pony: Friendship is Magic has a very large and dedicated game developer community centered around it, and they have poured out an absurd amount of fan games. One of the things that it has not seen much of in its relatively short existence are good, complete story-centered games. Video games as a storytelling medium are on the rise, although nowhere near the level of films and books, and certain games (such as Limbo and Superbrothers: Sword & Sworcery EP) have been called art by many individuals. 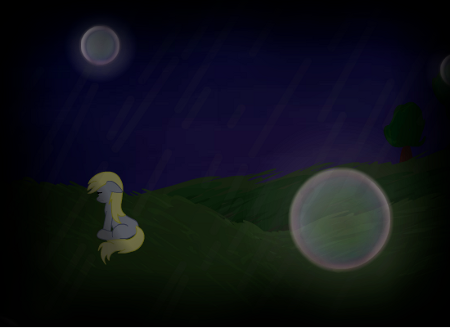 Today we have come across a recently completed fangame titled Derpy's Story, and it promises to be a short but sweet tale told through the form of a video game: a rare thing in this fandom. Does it live up to expectations? Find out in our review after the break. 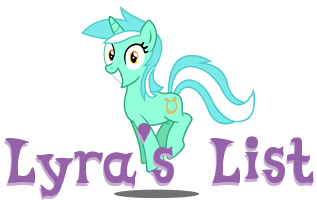 It's the first of the month - September to be exact, and with that comes a new Lyra's List! For those of you who've never heard of Lyra's List, or are interested in participating, follow that link in the previous sentence (or you could click here - they lead to the same place, I just added it for extra convenience - look how nice I am). Anyways, we have a small collection this week, which you can check out after the break. The deadline for submissions to Lyra's List #6 will be September 30, 2012.